Major normal lipoprotein metabolic pathways. Refer to text for detailed explanation. Blue arrows refer to points of action of the respective enzymes in blue. ABCA1, ATP binding cassette transporter 1; CE, cholesterol ester; CETP, cholesteryl ester transfer protein; FFA, free fatty acid; HTGL, hepatic triglyceride lipase; IDL, intermediate-density lipoprotein; LCAT, lecithin:cholesterol acyltransferase; LDL-R, LDL receptor; Lp(a), lipoprotein(a); LPL, lipoprotein lipase; LRP, LDL-R–related protein; SR B1, scavenger receptor B1; TG, triglyceride. Illustration by Josh Gramling—Gramling Medical Illustration. 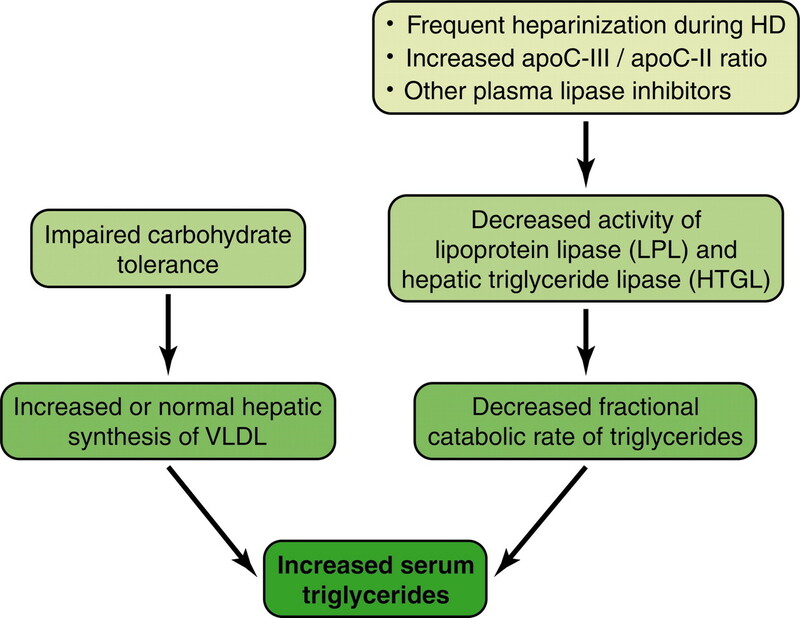 Pathophysiology of hypertriglyceridemia in uremia. Illustration by Josh Gramling—Gramling Medical Illustration. Kinetic parameters of apolipoprotein B (apoB) in LDL, apoB in IDL, and apolipoprotein(a) [apo(a)] in Lp(a). 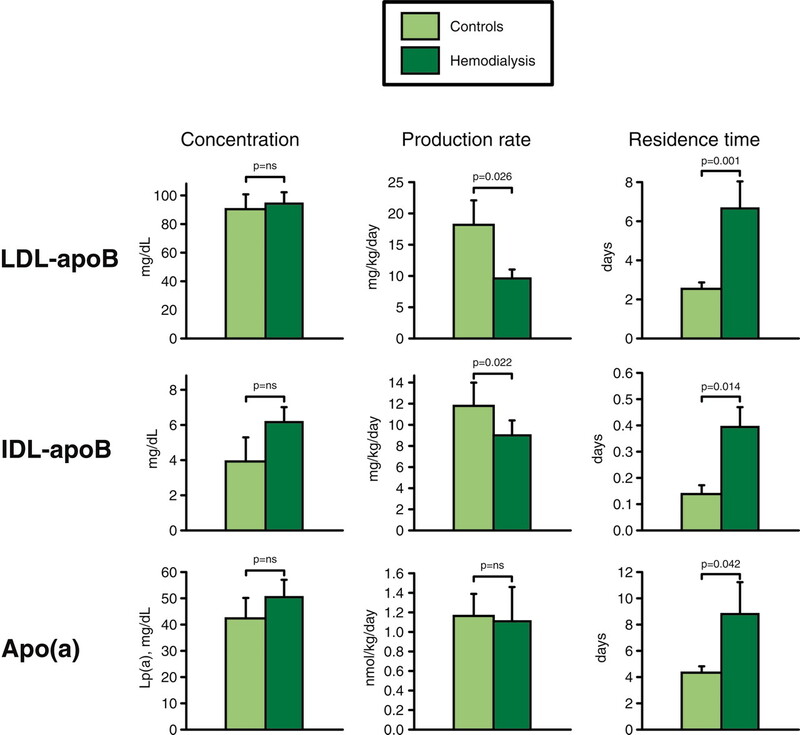 The concentration, production rate, and residence time in plasma are presented for control subjects (light green) and HD patients (dark green). Each bar represents mean ± SEM. Data for LDL and IDL are derived from reference (60); data for Lp(a) are derived from reference (76). Despite differences in the production rate and residence time, there were no statistically significant differences in plasma concentration of the three lipoprotein particles between HD patients and nonuremic control subjects. Illustration by Josh Gramling—Gramling Medical Illustration. 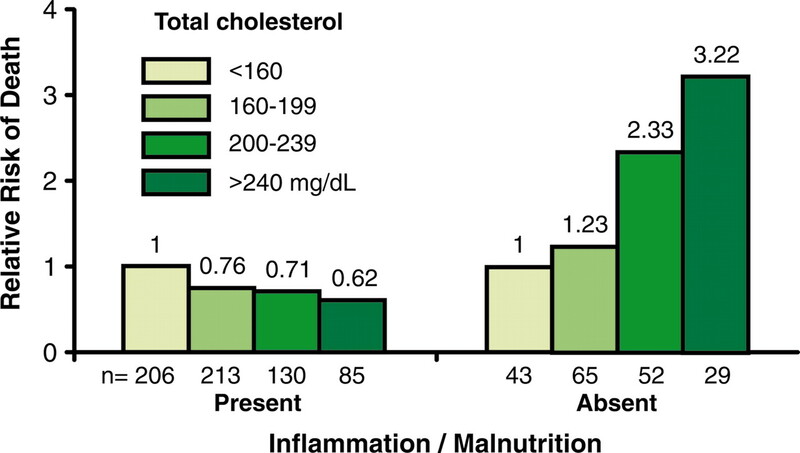 Relative risk for all-cause mortality associated with plasma total cholesterol stratified by the presence or absence of inflammation and/or malnutrition in the Choices for Healthy Outcomes in Caring for ESRD (CHOICE) study (84). Inflammation and/or malnutrition was defined as the composite of plasma albumin <3.6 mg/dl, CRP ≥10 mg/L or IL-6 ≥3.09 pg/ml (n = 634). The remaining 189 patients were free of inflammation and malnutrition. Illustration by Josh Gramling—Gramling Medical Illustration. ↵a These trends are derived from the composite of the literature. Non–HDL cholesterol includes cholesterol in LDL, VLDL, IDL, and chylomicron and its remnant. Explanation of arrows: Normal (↔), increased (↑), markedly increased (⇈), and decreased (↓) plasma levels compared with nonuremic indviduals; increasing (↗) and decreasing (↘) plasma levels with decreasing GFR. ↵a CHD, coronary heart disease; CI, confidence interval; CrCl, creatinine clearance; CVD, cardiovascular disease; HD, hemodialysis; HR, hazard ratio; PD, peritoneal dialysis; 4D, Die Deutsche Diabetes-Dialyse Study; CARE, Cholesterol and Recurrent Events Trial; PPP, Pravastatin Pooling Project; VA-HIT, Veterans Affairs HDL Intervention Trial; HPS, Heart Projection Study; LIPS, Lescol Intervention Prevention Study; ASCOT-LLA, Anglo-Scandinavian Cardiac Outcomes Trial: Lipid-Lowering; USRDS, United States Renal Data System; DOPPS, Dialysis Outcomes and Practice Patterns Study; GENDIAN, Genetic and Clinical Predictors of Morbidity, Mortality, and Diabetic Nephropathy with ESRD Renal Disease in Diabetes Mellitus Type 2.